Whirlpool 21 cu.ft. top freezer refrigerator with interior water dispenser. Featuring Temperature Management System enabled by 6th Sense® Technology, senses and adapts to deliver great cooling performance and food preservation. Adaptive Defrost in the freezer saves up to 12% more energy by running the defrost cycle only when necessary and monitoring how often the compressor operates and the doors are open. 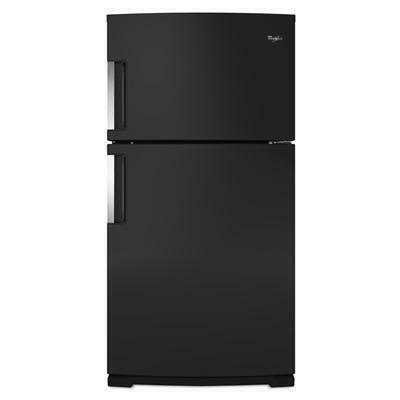 As compared to previous Whirlpool® top-freezer models with Adaptive Defrost; based on 24-hour interval with refrigerator doors left unopened. This top freezer also includes a factory installed ice maker. Technologies FreshFlow™ Air Filter; FreshFlow™ Produce Preserver: Extend the freshness of produce up to 25% longer with the FreshFlow™ Produce Preserver. A filter absorbs excess ethylene gas that causes fruit and vegetables, like lettuce and cantaloupe, to spoil. Replace the filter every 6 months for optimal performance; PUR® Water Filtration System: Kick the bottled water habit with the PUR® water filtration system. 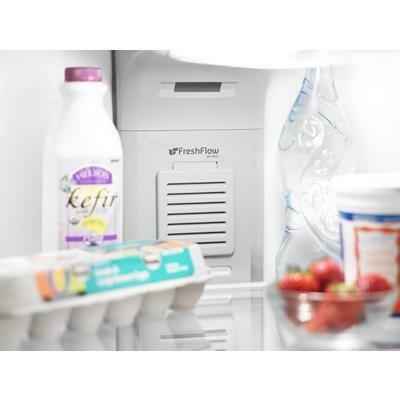 You'll save up to $600 a year and have more space in the refrigerator Select models offer filtered water from an interior or exterior dispenser; SpillMizer™ Glass Shelves; Temperature Management System Enabled by 6th Sense® Technology. Additional Information Full-width Pantry; Tilt-n-Go Door Bin: The Tilt-n-Go door bin a great for condiments or a carton of eggs. It holds items securely and can be removed from the refrigerator door and placed on the table or counter. Adjustable Door Bins; Fold-away Shelf: Make room for tall items. 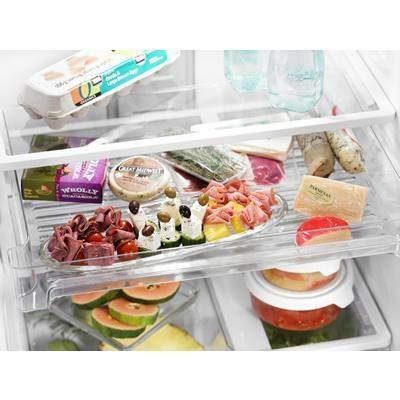 The front of this adjustable shelf slides out of the way creating temporary storage space for containers like a tall 2-liter bottle or a large salad bowl; Humidity-controlled Crisper Bins; Factory-installed Ice Maker; Interior Water Dispenser. Additional Dimensions Depth Closed Including Handles 32 1/2(82.55cm); Height To Top Of Cabinet 65 1/2(166.37cm); Depth Radius 62 1/4(158.11); Depth Excluding Doors 28 1/2(72.39cm).